One of my favorite PC gaming publishers of yesterday has always been Sierra- specifically their adventure game ‘Quest’ titles that ran from late 80’s into the 90’s; King’s Quest, Police Quest, Space Quest, and notably the Quest for Glory games (formerly Hero’s Quest until a legal battle with Milton Bradley over their similarly titled board game). Successfully completing any of the titles in the aforementioned series depended on completing puzzles that could only be solved by gaining an intimate knowledge of the game’s story and characters. The majority of these games lacked a speech component, which resulted in this experience akin to exploring a visually rich Choose-Your-Own-Adventure book. If you haven’t ever played through these titles, try giving Quest for Glory: So you Want to Be a Hero? (VGA) or King’s Quest V: Absence Makes the Heart Grow Yonder! (VGA w/ speech) a try. Sierra was sold by owners Ken and Roberta Williams in 1996, and after a successive number of subsequent acquisitions, mergers, and scandals with different parent companies, Sierra was finally absorbed by Blizzard / Activision. As Sierra was traded and dissolved, much of the company’s core talent was fractured and lost, such as the creators of the Quest for Glory games, Corey and Lori Cole (“The Coles”). Corey’s last involvement with a game appears to be a programming credit in Hoyle’s Casino in 2000, Lori’s was a writing credit for Quest for Glory V: Dragonfire in 1998. At least until 2013. 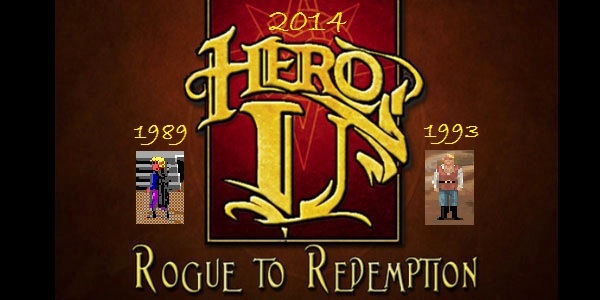 The Cole’s are now back at it again with a new production company titled Transolar Games and a new title in development, Hero-U: Rogue to Redemption. Hero-U was made possible by a successful Kickstarter campaign. The campaign raised $409,150 raised toward their $400,000 goal, and gained an additional $23,000 on PayPal. This makes it one of the highest crowd funded companies of 2013. Hero-U has a projected release date of summer of 2014, but Project Update #44 seemed to imply that might get pushed back a little bit. However, I’m really not concerned. The Coles have taken out a home-equity loan to help finance development of the game. I can’t imagine a more motivating mechanism than, “Hey, we might loose our house if we don’t produce”. The game play is loosely based off of a book Lori was co-writing in 2003 titled, How to be a Hero. That book became a website based game, and that game became the Hero-U RPG they are now working on. Lori has a portfolio filled with highly imaginative and creative stories, I’m certain Hero-U will be no different. I’d encourage everyone to check out their website, and consider trying to still donate to the project (it wouldn’t surprise me if they’d still accept crowd funding donations via PayPal).